In need of money, Lucy writes on the back of a rubber check: "Dear Teller, Be a lamb and don't put this through until next month." Infuriated, Ricky declares: "Well, Lucy, what have you got to say?" Lucy: "Now I know why they call them tellers. They go around blabbing everything they know." Disgruntled by Lucy's spendthrift ways, Ricky insists she would feel differently about money if she had to "bring home the bacon". With Ethel's support, Lucy agrees to switch roles for a week. The girls will get jobs if the boys stay home to do the housework and cooking. Their first stop is the Acme Employment Agency, "People We Place Stay Put", where Mr. Snodgrass interviews them. Fibbing about their experience, Lucy and Ethel land jobs as candy makers at Kramer's Kandy Kitchen. The factory foreman assigns Lucy to the candy-dipping section where disaster soon strikes, ending in a chocolate war with a co-worker. Ethel fares no better in the boxing department, and soon both girls are transferred to "wrapping" where their task is to wrap each piece of candy as it goes by on a conveyor belt. Unfortunately, they find it impossible to keep up with the swift-moving contraption and, in one of the funniest scenes ever telecast, are forced to stuff the excess candies into their mouths, hats, and blouses. As "housewives," Ricky and Fred are doing no better. Ricky makes a mess of the ironing and a bigger mess of the kitchen when he attempts to cook arroz con pollo for dinner (Fred bakes a seven-layer cake that is as flat as a pancake). The men hurriedly retreat from the shambles to buy five-pound boxes of chocolate for the wives, as a peace offering. You can imagine the looks of Lucy and Ethel's faces when they arrive home from their first day on the job, defeated and fired. The four finally agree to call of the "switch". 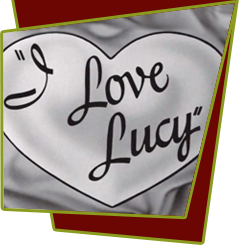 Special Notes: This is one of Lucille Ball's favorite "I Love Lucy" episodes. The candy dipper, Amanda Milligan originally had lines in her scene with Lucille Ball but these were cut because of Milligan being uncomfortable talking on camera. Amanda Milligan was a real life candy dipper who worked at the Farmer's Market in Hollywood. At the time of this episode, she had never seen an episode of "I Love Lucy" before because she watched wrestling on Monday nights. Elvia Allman later became famous for her role as Selma Ploutt on Petticoat Junction. This episode is based on lucy's radio show, My Favorite Husband, Episode #78, "Women's Rights, Part 1" and Episode #79, "Women's Rights, Part 2". Bloopers: Ricky really does trip on the overflowing rice dripping on the floor, badly bruising his ribs in the fall that wasn't scripted. While the conveyor belt is speeding up, Lucy was too soon to eat one of the chocolates. Realizing her mistake, she quickly removed the candy and dropped it on the floor.